We invite you to spend about 10 minutes each day hand copying passages of Scripture. This will give you a more intimate understanding of the Word of God and bring you closer to God’s message for the world. By hand writing each passage you are forced to slow down, allowing you time to reflect, and appreciate what you are reading. Hand copying can be a fun way to help you remember what you read in the Scriptures. 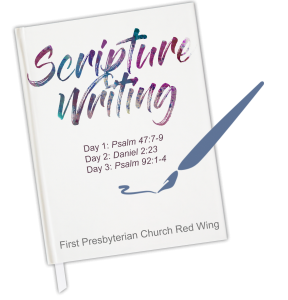 If you love to journal or it is something you have always wanted to try but never knew how to start, this is a great way to connect with yourself as well as the Word of God! Each month we will post copies of each month Scripture Writing Plan at the kiosk and in the weekly happenings! Have fun! !